I think you r swirling for too long. it looks "grainy"
Add coating and swirl for like 12 seconds only, then dump them onto the tray to dry. Yessir, also they're not paying the acetone test. Aside from possibly shake coating for too long, you may be using too much coating mixture. I say this, as you are having coating flakes that are drying in your coating bucket flaking off, a excess residue remaining, that was not used up coating your projectiles. When you add coating mixture, this should dissolve the dry stuff that is in your bucket . If you have a build up of coating in your bucket, you can simply add only a little Acetone to your coating bucket with your next lot, then, mix/coat, and this should use up residues left in your coating bucket and be regarded as a first coat/primer. Don't worry if it is blotchy and uneven. Simply mix/shake coat to use up solvent and residue, then dump it to dry before it gets tacky. If you get it to a tacky stage, don't worry, just add a small amount of Acetone in again, swirl coat, and this time don't swirl coat for as long so that it does not become tacky. Some, simply wash out their coating container, and use that for making up coating mixture. Please consider, that the coating can be recycled back into use after it has dried. The coating cannot be recycled after it is heat set. I started cleaning my bucket, but will do your method instead of just dumping left over residue. I think it was a few different of each, the residue which was just an oversite on my part. Noticed in videos I've watch a dozen time a day their bucket was clean each time. Then I was covering my tray like you had said and I don't believe I was doing a thorough bake, so I uncovered and baby say it every 2 1/2 minutes i'd shake and turn and now they're passing both tests again. So tomorrow I'll cast some more after I shoot some of these to reward myself for my labors. Lol can I size these in my lyman lubrasizer, which will probably get live on them? I don't have a single stage sizer for this bullet other than on my lubrasizer. It might not get any lube on them but if it does will it hurry. Thanks for all your help!! Getting lube on a bullet your going to reload and shoot is no big deal. It's just going to smoke a little. Getting lube on a bullet you intend to re-coat is a problem as it will cause adhesion issues. Thank you, I figured it would be ok.
You might find that the Lyman Sizer die will tear off some coating. Mine did. The holes where the lube comes out were the problem. That is why I went to Lee sizer dies. You should see the coating buildup in my hand swirling bucket. Huge!!!! It is like 1/8" thick around the sides. 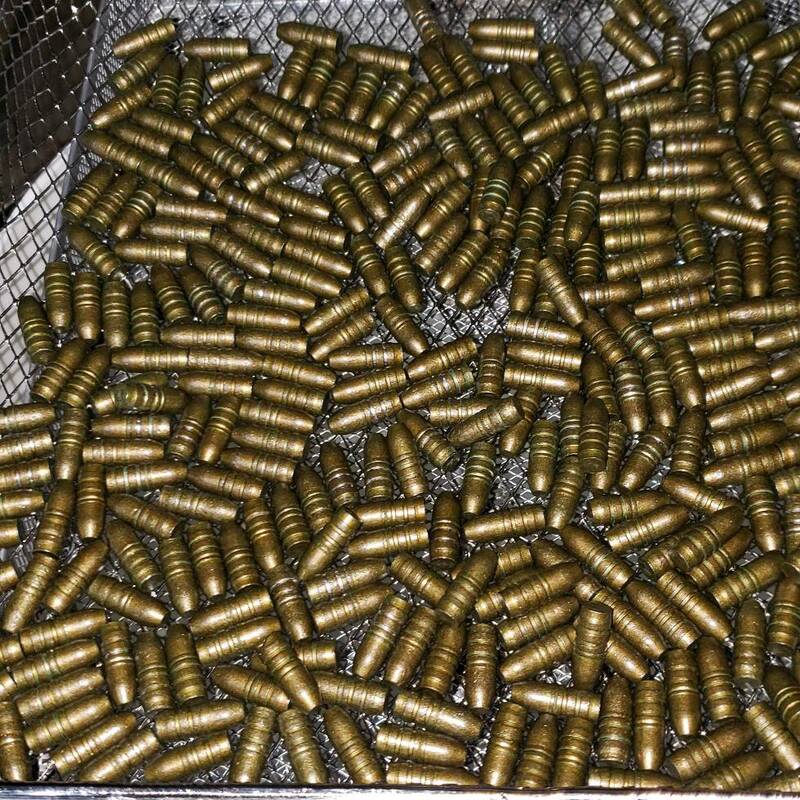 The machine swirler buckets get cleaned every 10,000 bullets. I ordered one last night for the lee sizer. I didn't have one for the lubrasizer. But you're not running un-cooked boolits through the sizer are you? What does the jury say,is this acetone wipe test fail or not? Seriously overbaked Zombie green,I even gave it another 30 min. My tin rich WW/Monotype Mystery Alloy does this with ZG. I'm new to this but am also using zombie green. I'd say yes but not bad, and they overcooked. They say zg is hard to get. I'm still trying cause either they're burnt or grainy. burnt is from over baking, grainy is from tumbling to long. 4) bake for a full 12 min (cover the bottom of your oven with something that retains heat I use ceramic BBQ briquettes, some use firebrick or chunks of metal -- this helps the oven get back to temperature faster. Last edited by Grmps; 10-08-2018 at 02:51 PM. Shanep, do they pass the smash test? At first no, but I bake them longer and that fixed that. I'm probably going to start completely over, remix everything. I think that's a good idea. Remember, thin coats! My last failure (some time ago) was due to making the coats too thick. They looked good but flaked badly when flattened, I had to remelt the lot. I hadn't coated any for quite a while as I have several thousand coated projectiles stored, but the other day I just felt like doing some casting. I figured I might as well coat them too, so the next day away I went. Two coats of Texas Tea, one batch I did three coats just to see what they looked like but two coats is perfectly functional. Because I experimented with very thin coats they came out slightly splotchy looking but passed the smash test (most important). Another 1120 to add to the collection. I use my Star Lubri-Sizer to size my coated bullets. Works great. Mine hasn’t seen lube in years. My reloading shop has an old RCBS sizer for $30 that is all greased up but in complete condition. I'm going to pick it up just to size coated bullets. The lube holes in the Lyman & RCBS lube sizer's tend to cut the coating on cast bullets. Maybe some one can add more info on this, I size all my coated bullets on a Star sizer with the lube arm removed.